The problem is worse in outer space, but it’s pretty bad on earth too. Invisible, odorless airborne toxins and chemicals sicken people indoors. The American College of Allergists estimates that 50% of all illnesses are caused by polluted indoor air. What causes indoor air pollution? What are the symptoms? 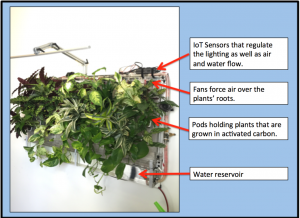 How can IoT reduce air pollution? How can biomimicry help? Should you read further? Check the air quality index where you live and decide for yourself. Trichloroethylene (paint, lacquers, varnishes, paint remover). Symptoms associated with short-term exposure include excitement, dizziness, headache, nausea and vomiting followed by drowsiness and coma. Formaldehyde (waxed paper, particle board, plywood, synthetic fabrics). Symptoms associated with short-term exposure include irritation to nose, mouth and throat, and in severe cases, swelling of the larynx and lungs. Benzene (plastics, resins, detergents, paint). Symptoms associated with short-term exposure include irritation to eyes, drowsiness, dizziness, headache, increase in heart rate, headaches and confusion, and some cases can result in unconsciousness. Xylene (leather, tobacco smoke, rubber). Symptoms associated with short-term exposure include irritation to mouth and throat, dizziness, headache, confusion, heart problems, liver and kidney damage, and coma. Ammonia (window cleaners, floor wax). Symptoms associated with short-term exposure include eye irritation, coughing and sore throat. Volatile organic compounds (VOCs) including formaldehyde, toluene and benzene. A metal oxide semiconductor is used to provide a global picture of levels. CO2 levels are calculated with an algorithms and VOCs levels rather than a specific sensor. Particulate matter is detected with an optical sensing system. It detects even the finest particles that get from the bloodstream to the lungs. PocketLab Air is an all-in-one science lab for investigating climate change and air pollution in your environment. It measures carbon dioxide, ozone, particulate matter, temperature, humidity, barometric pressure and light. You can support its Kickstarter campaign here. Blueair Aware measures and monitors indoor air quality. It detects airborne particles, volatile organic compounds, carbon dioxide equivalents, temperature and humidity. It communicates via Wi-Fi 802.11B/G/N, 2.4 GHz security open/WEP/WPA/WPA2. The Blueair Friend app is updated continuously and data averaged over a five-minute interval is also sent to the Blueair cloud for visualization. Air View, its online application, displays real-time air quality data at locations worldwide using local sensors. Artificial filters remove harmful compounds in the air, but can’t replenish the oxygen. Filters capture pollutants but don’t eliminate them; they must be cleaned frequently. Plants break down noxious substances into harmless compounds and in some cases assimilate them. 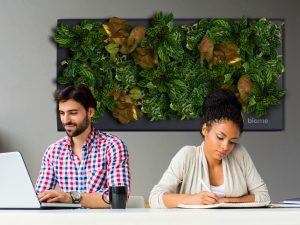 Green walls require much less power to operate than traditional HVAC systems. 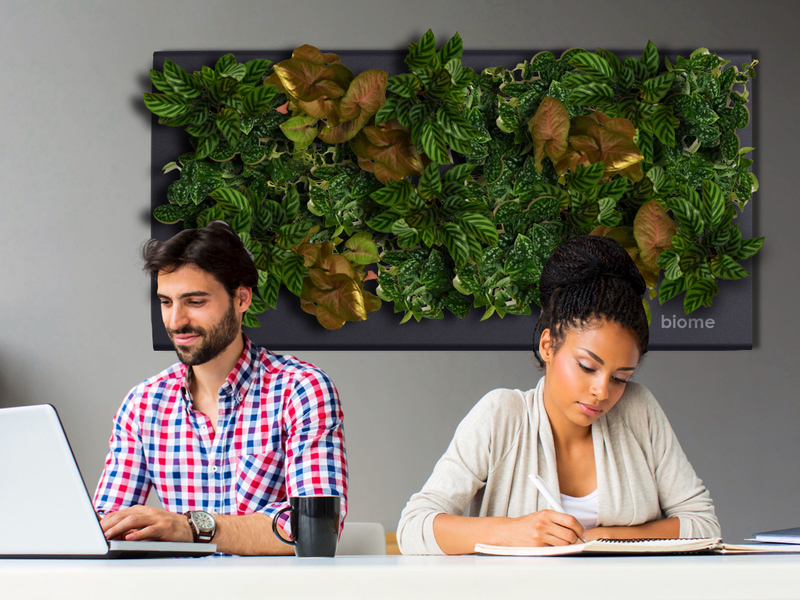 Biome offers a stylish, indoor living wall with plants growing in small pods. Air is forced over the roots of these plants, where microbes remove and digest the pollutants. They release oxygen and there aren’t any filters to clean. The unit is self-contained and resembles a large, wall-mounted flat-panel TV. 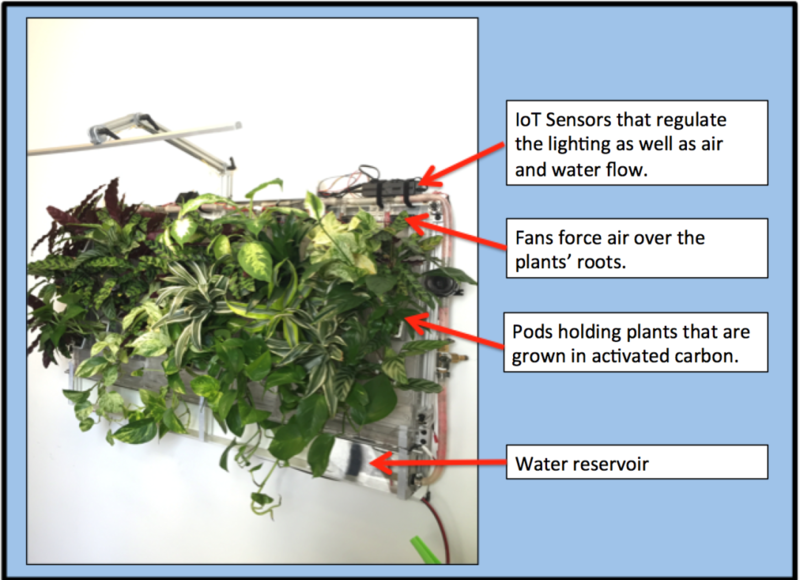 Air quality sensors determine how much air should be processed and adjust the speed of the fans accordingly. Forcing air over the plants’ roots increases the rate of air purification. The next time you’re drowsy at work, check the air quality first. Perhaps bioremediation might just make you feel better!